Lightspeed Core Value #5: "Design simplifies the complex"
Visualizations are how we take innumerable rows of data and make them meaningful. With the right combination of Dimensions, Measures, Calculations and sorting, we can quickly identify outliers, patterns, and trends. 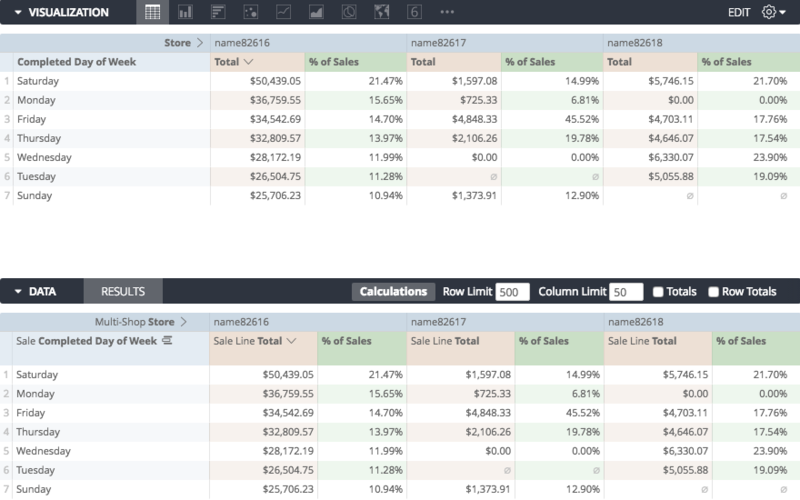 It's also the visualizations of reports that are sent out in subscription emails, so it's worthwhile to have a few points to make the most of your visualizations. It's best to discover the visualizations yourself, to find which ones best illustrate the patterns you want to follow. These are a few observations you can think about when preparing your own visualizations. *Be forewarned that this discussion may become somewhat subjective, as there is an aesthetic component to visualizations. I will do my best to make the observations below as open to different tastes as possible. Check out the table visualization. 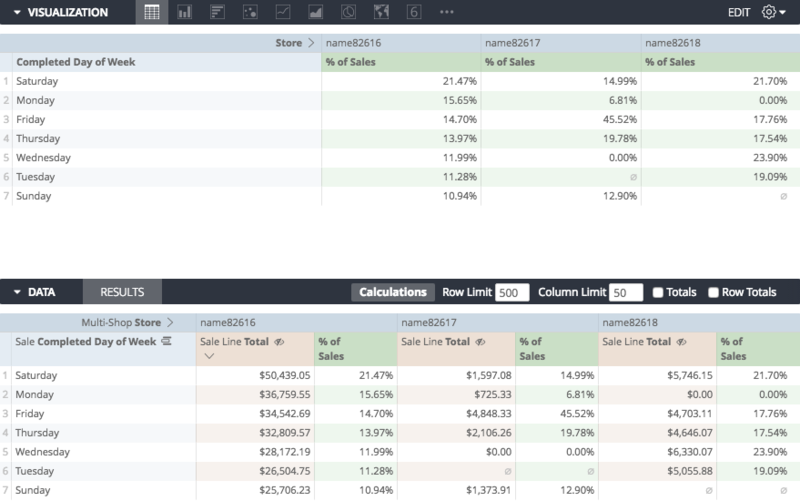 While not much more exciting than the report builder, this is important because you can see which data is being included in your visualization. 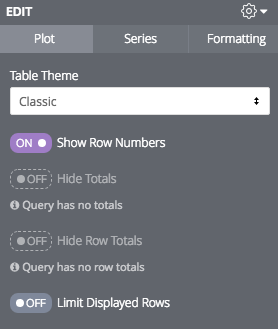 Hide Columns that you don't need. 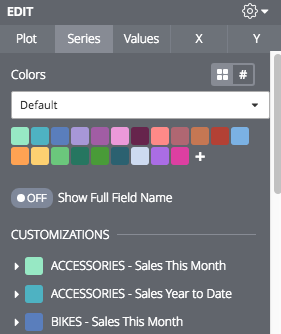 When hovering over any column title in the report builder, you will see the options to pivot, remove or hide from visualization. This way you can focus specifically on the numbers that you wish to measure. 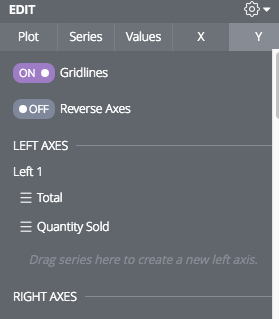 You will get an "eye" icon on columns which are hidden from visualization. 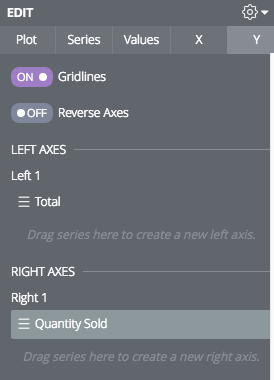 Break out the types of measures. Sometimes graphs need to look at multiple sets of measures to be fully meaningful. Perhaps Qty, GMROI, a Dollar amount or a Turn might be important on one of the visualization. This way, I measure the dollar amounts on the left hand side of my graph, measure the qty amounts on the right hand side. 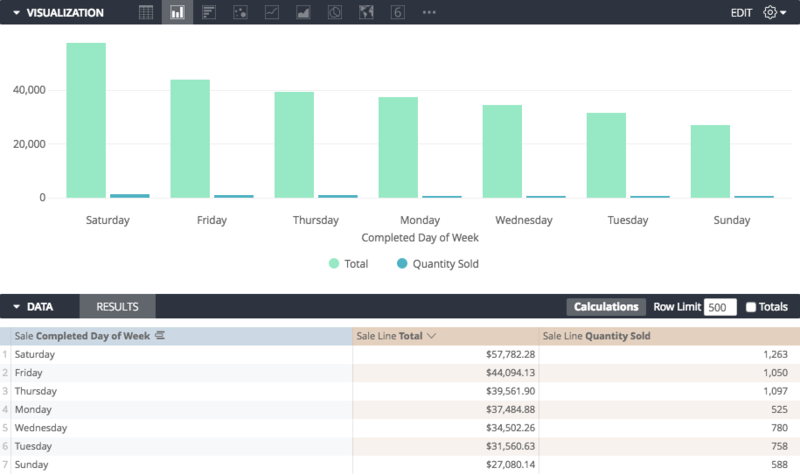 A good way to gather sales data from different time frames is to sum their respective totals, and then show only the first line of totals in the visualization. 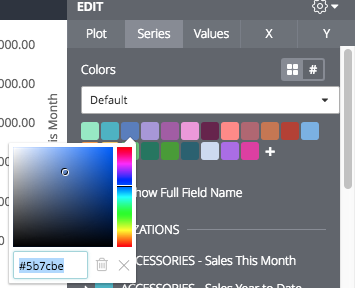 And then select "Limit Displayed Rows"
On the "Series" tab, you can access the colours being displayed on your graphs. 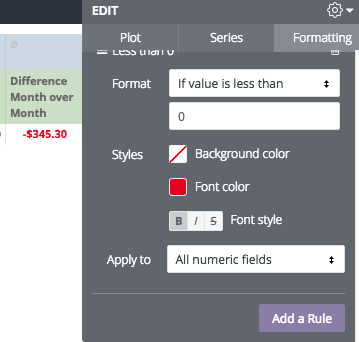 and start by selecting "If the Value is less than... 0"
And our table follows the rules that we have set!